9044 Fine Ansonia Triumph mirror side clock. This clock is in exceptionally good, original condition. The solid oak case has the original finish and there are no breaks or chips at all. The crest, all the finials, the cast metal trim, both mirrors and the cast metal cupids are all original and perfect. It has an excellent stenciled glass signed “Ansonia” plus a spider web, owl etc. The stenciling does not show any wear. The dial paper is signed and in great shape. It comes with the original hands, key and nickel plated pendulum. This is an eight-day clock with hour and half hour strike on a coil gong. It is running but sluggishly and it should be cleaned before it is run continually. 24 ½ inches tall. $425. 9045 Kroeber Plymouth ebony cased mantle clock. This clock has been well cared for and is in superior, original condition. The ebonized case has turned rosettes and incised gilt decoration all of which show no wear or damages. The glass is one of the best, being done in gold leaf not the usual plain stenciling. It has the original porcelain dial which is just about perfect having just a tiny amount of roughness around each winding arbor. The pendulum is exceptional with a cut glass starburst against a mirrored background. It comes with the original hands, signed beat scale and two labels on the back. It even has the original signed Kroeber key. This is an eight day clock with hourly strike on a nickel bell. The movement is signed, has Geneva stops and is in good running order. 9046 New Haven No. 504 walnut parlor clock. Clean, fully restored and ready for your shelf. The solid walnut case has been very nicely refinished and is without any damages or problems. The reverse decorated glass has stenciled designs, colorful flowers and is in excellent condition. The painted dial has no paint loss and is very clean. It has the original hands, key, a partial label and a fancy brass pendulum with the needle fast/slow adjustment. This is an eight-day clock with hourly strike plus alarm. The movement was recently professionally restored and it is in good running order. This clock has a solid walnut case in the original finish which has been cleaned and polished. The case is perfect without any damages or problems. 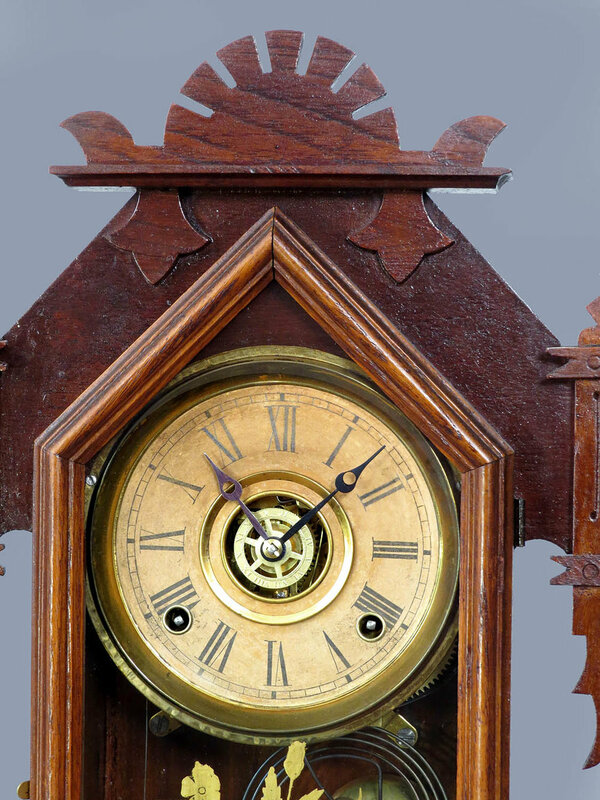 With the heavily carved base, curved top and fully turned finial it has an impressive look and was an expensive clock in 1881 when it was produced. That is the date when it appears in the original Waterbury catalog. 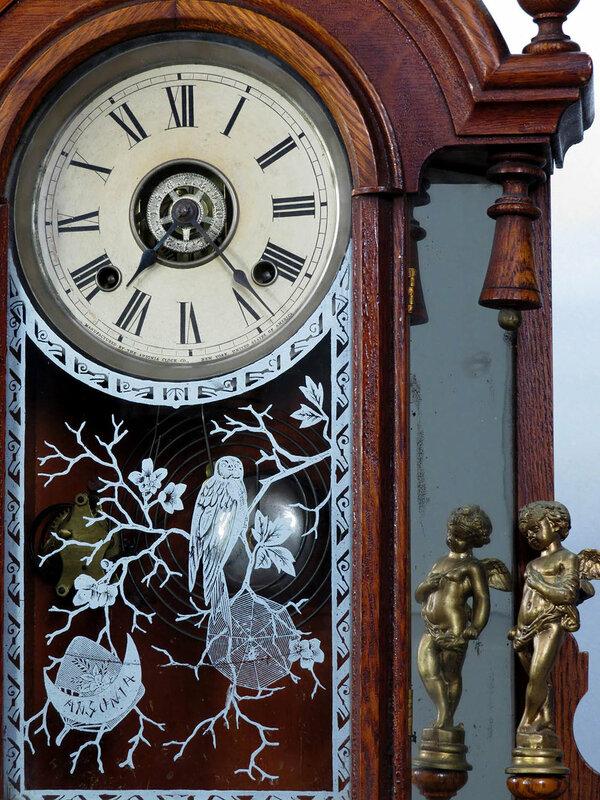 It has a nicely stenciled glass with a central opening to view the nickel plated pendulum. That pendulum has glass a red and gold starburst center. The dial has been repainted and it looks fine. It comes with the original hands and one label on the back. This is an eight-day clock with hourly strike on a coil gong with a nickel plated base. It was recently professionally serviced and is in good running order. 9048 Rare Russell and Jones, Pittsfield, Mass. This is a fine clock and one seldom found by this maker. Russell and Jones took over from the Terry Clock Company in 1889. They were only in business until 1893 and they did not produce a large volume of clocks so these have become quite collectible. 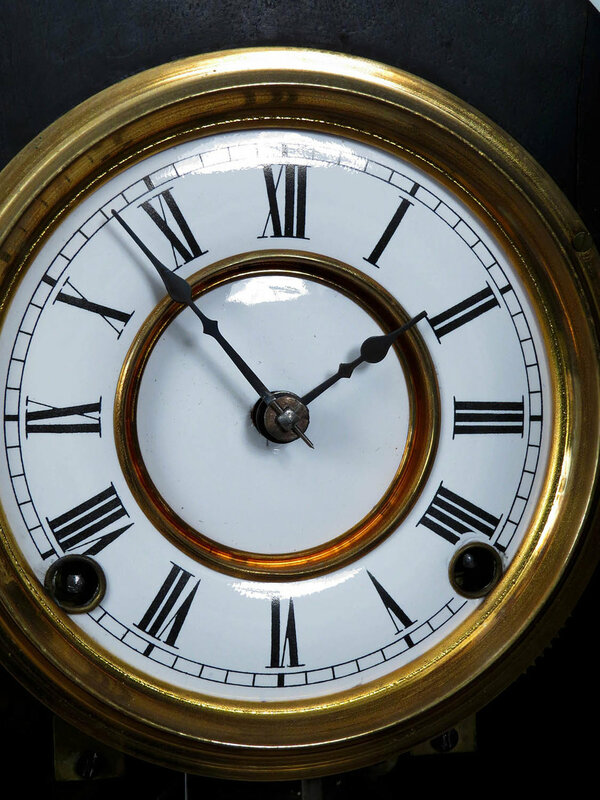 This clock has a nicely refinished solid walnut case which is in fine condition without any blemishes or problems. 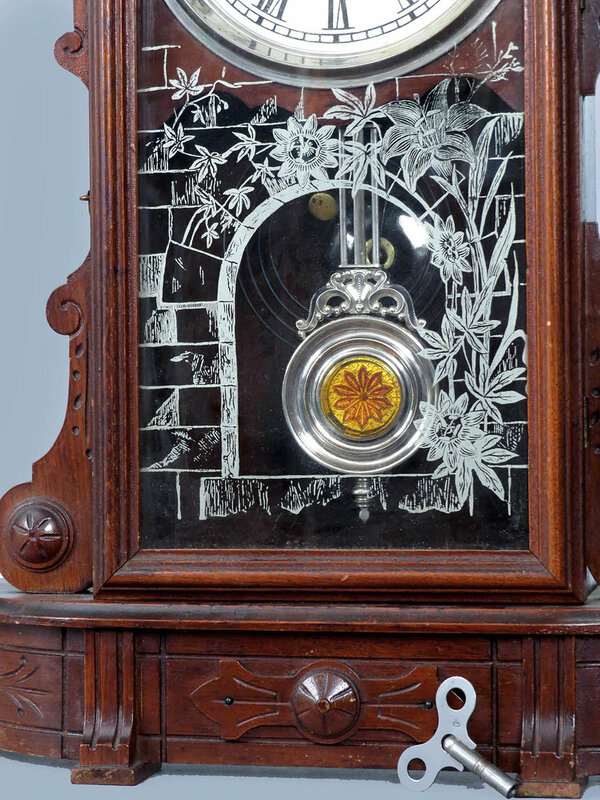 It has an excellent reverse decorated glass with a central opening to view the pendulum. That pendulum is quite fancy with an etched design in the convex center. This clock has the original signed beat scale paper and red label in the case interior. The hands have been replaced. The dial has been shifted at one point creating an extra set of screw holes but I am sure this is the correct dial for this case. This is an eight-day model with hourly strike on a coil gong with a brass base. It was recently professionally serviced and is in good running order. 9049 Ansonia walnut parlor clock. 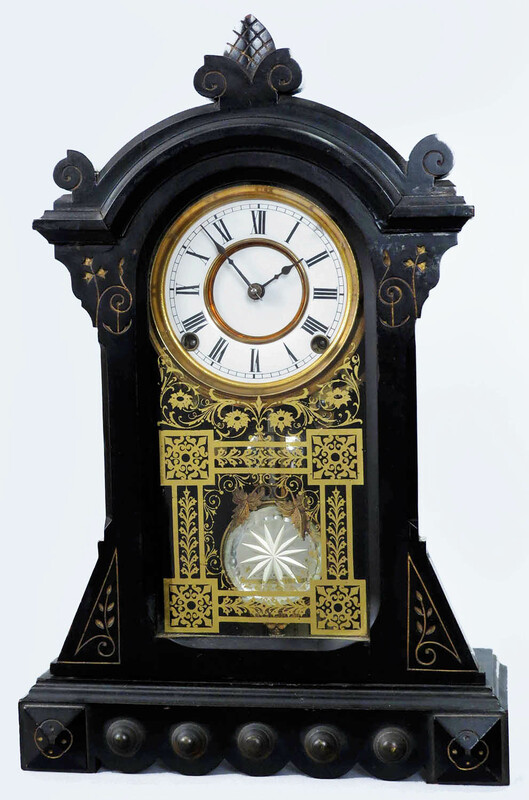 This clock is a step or two above the average parlor clock because the case is so ornate. Made of solid walnut, there are freestanding columns at the sides and a very elaborate top. The case has its original finish and it looks like another coat of finish was applied on top of that many years ago. I do not see any case damages, chips or repairs. This clock retains the original stenciled tablet, fancy two-tone barrel pendulum, hands, signed beat scale and gong base. The dial paper with the Ansonia logo has become rather dark but all the numerals are still visible. This is an eight-day clock with hourly strike on a gong. It has been running well for me for several weeks. 9050 Russell and Jones, Pittsfield Mass. 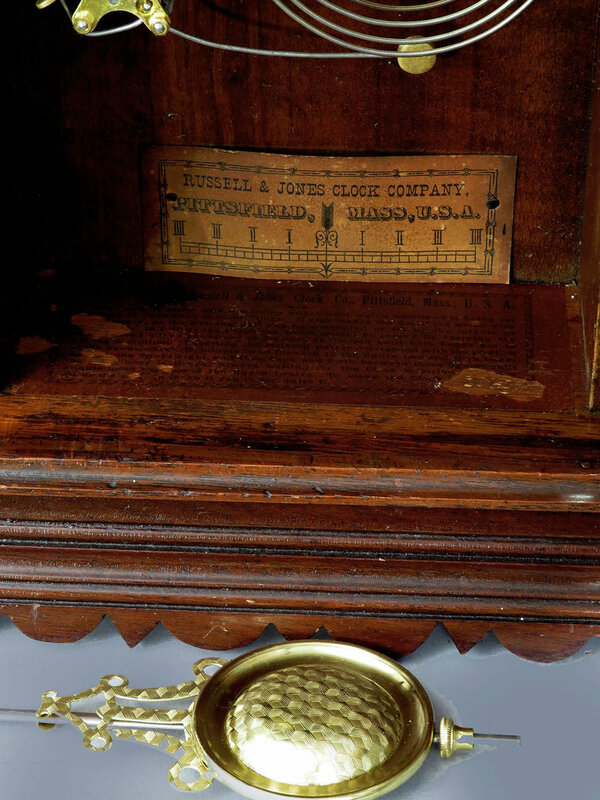 This clock is not signed anywhere but in their 1890 catalog, Russell and Jones showed this as the Cowper model. Also, it has the very distinctive Russell and Jones ornate brass pendulum. The solid walnut case has been very nicely refinished and there are no chips or other case issues. The original stenciled glass tablet shows a little wear from many years of cleaning. The dial has an Ansonia logo and there is another set of dial mounting screw holes so this may not be the original dial to this case. The hands are reproduction replacements. This is an eight-day clock with hourly strike. It was recently professionally serviced and is in good running order. This clock has a solid walnut case with a very clean and polished original finish. It is in excellent condition without any damages or repairs. It has an original stenciled glass which does show a little wear from many years of cleaning. It has an original painted dial which is in very good condition. It also has that ornate Welch cast brass pendulum with colorful glass center similar to those used in the Patti models. It has the original hands plus a label on the back. This is an eight-day clock with hourly strike on a nickel plated bell. It runs a short while for me and stops. 9052 Unusual E. N. Welch Mfg. Co. Bristol Conn.
walnut parlor clock, Coghlan model. This clock shows up in the Welch 1885 catalog. It is interesting for a couple of reasons. First, the case is made of solid ash with ebony painted highlights. This gives it a very pleasing look with the light colored case accented with black trim. The case has been beautifully refinished and it looks great. The second feature is that it comes with a custom-made shelf that is a perfect match for the clock. It would be hard to tell that they did not start out life together they are such a good match. It truly will look great on your wall. The painted dial is in much better than average condition and it has a perfect, original stenciled glass tablet. It has the original hands plus the fancy Patti style cast brass pendulum with cut glass center. Only a portion of the label remains. This is an eight-day clock with resonant hourly chimes on a heavy cathedral gong. It was recently professionally serviced and is in good running order. 9053 E. Ingraham Company, Bristol, Conn.
oak Cabinet No. 16 mantle clock. This clock appears in the Ingraham 1896 catalog at a cost of $6.25 which was probably a significant amount of money at the time. The case is solid oak with separate applied trim pieces. It was refinished a number of years ago and it looks fine, without any case problems or damages. The only item to mention is that the rear tin cover is a replacement. This clock has a nice brass dial, pendulum view window, a good label plus the original hands and pendulum. This is an eight-day clock with hour and half-hour strike on a cathedral gong. I do not know when it was last serviced but it seems to be running well at the moment. 15 ½ inches tall. $120.